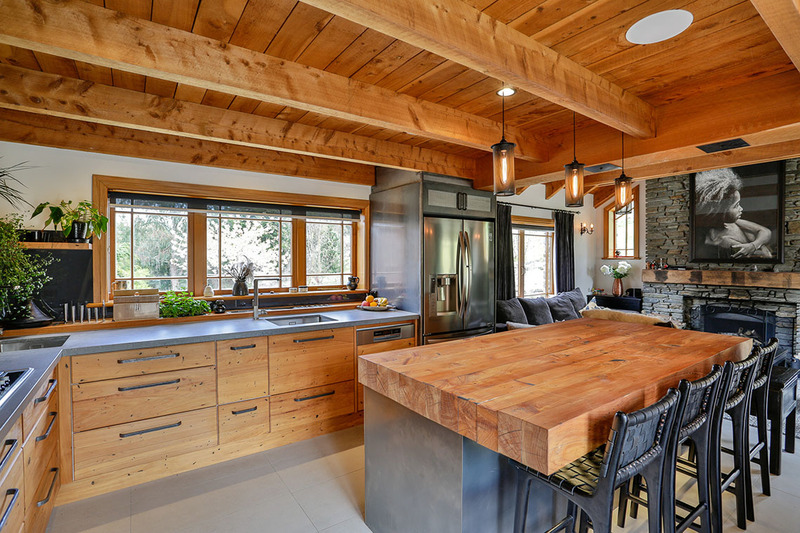 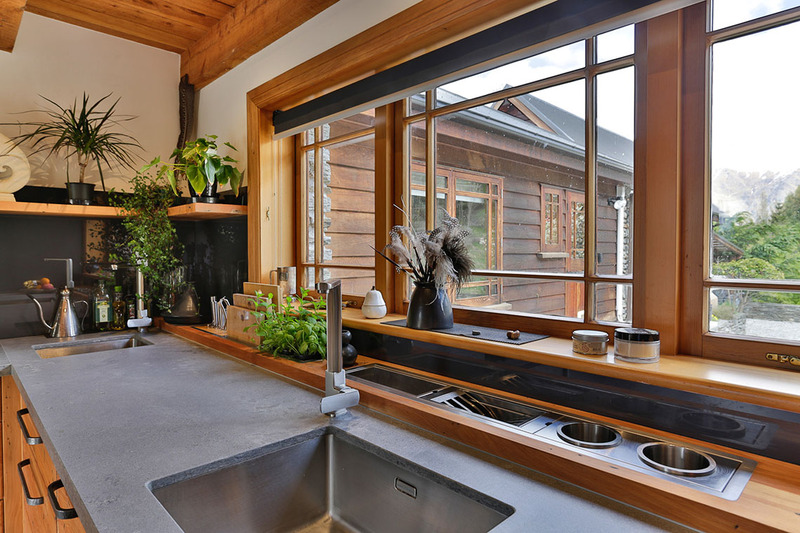 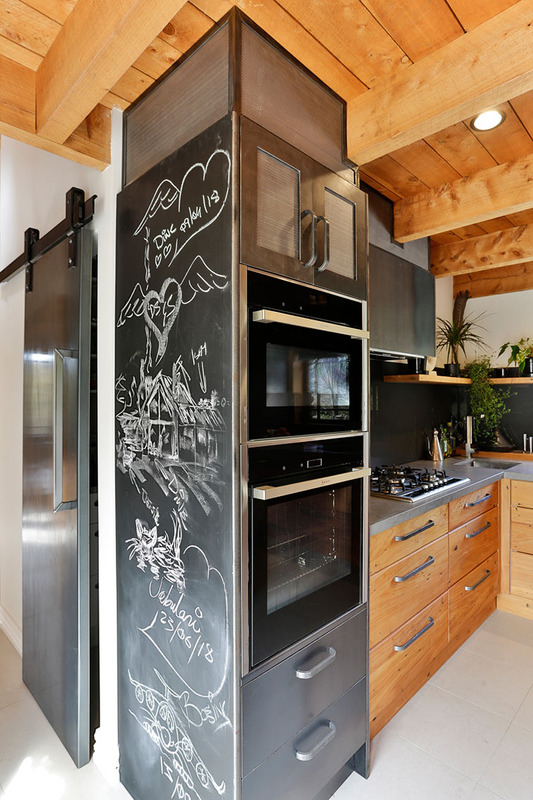 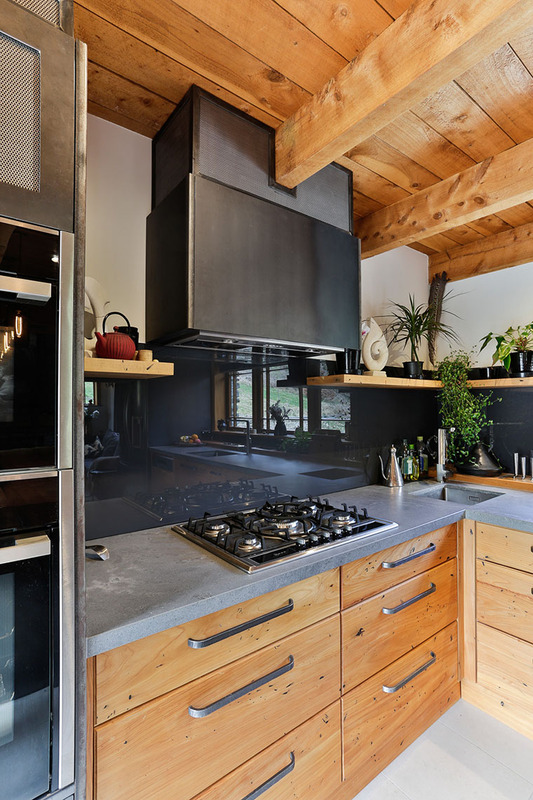 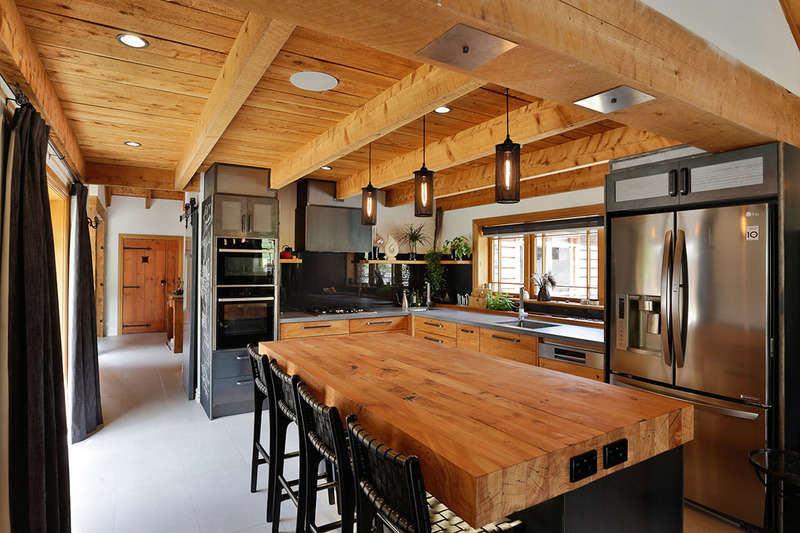 A specific brief leads to a spectacular kitchen that combines the natural warmth of Macrocarpa with raw industrial elements, including concrete, blackened steel and wrought iron. 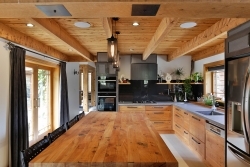 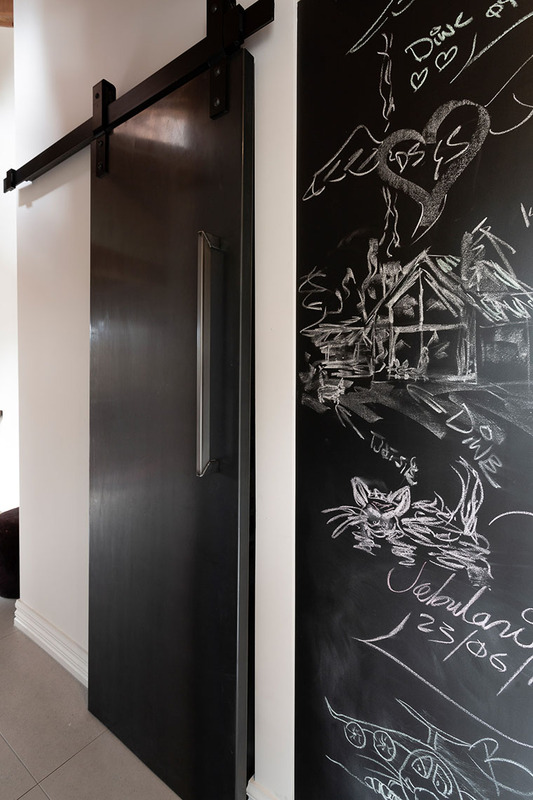 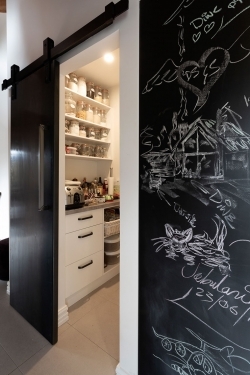 Homeowner Dawn Sherbrooke had a very clear, albeit a quite unusual vision for her new kitchen. 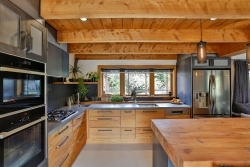 It was based around the look and feel of the ‘Diesel Social Kitchen’ that she’d found on the likes of Pinterest – a look not dislike that of a raw, industrial steampunk aesthetic, says Mastercraft Kitchens Southland designer, Anne Finlayson. 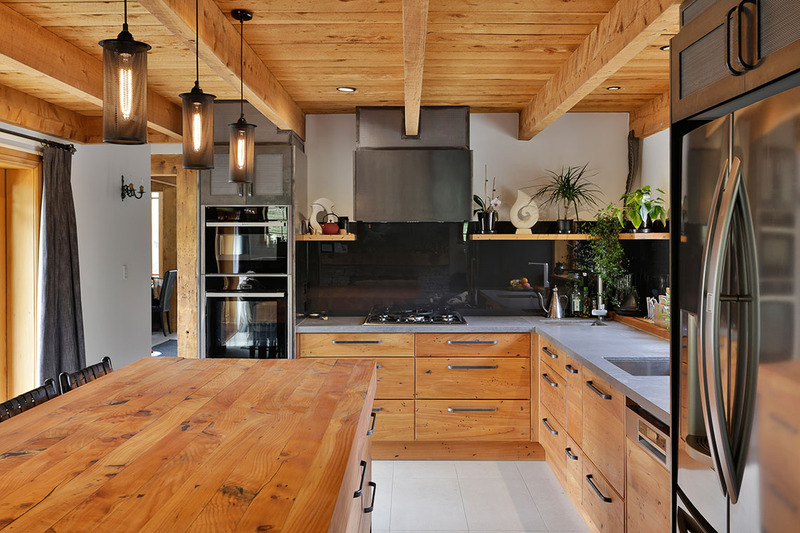 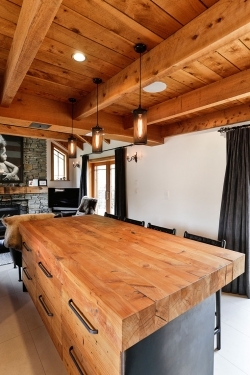 “Dawn also wanted the rugged timber theme that was prevalent in the rest of her home to come through into her new kitchen, so it was quite a challenge to combine both looks successfully,” she says. 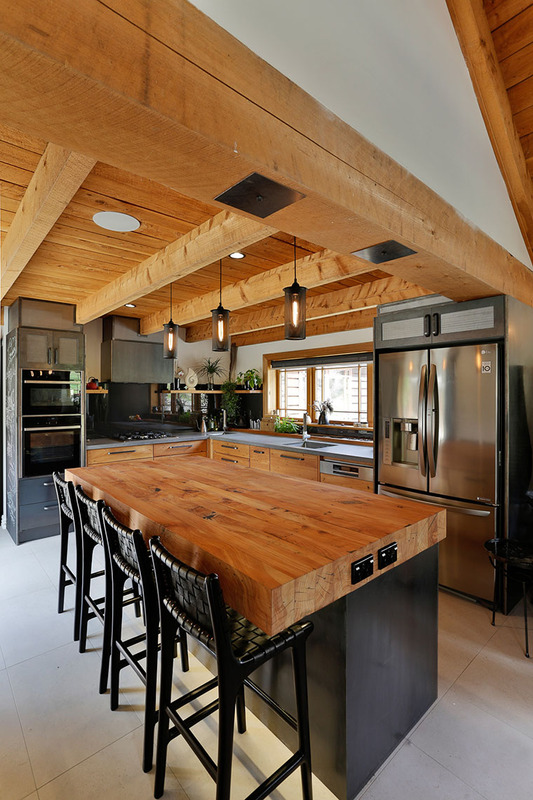 The new kitchen stands in exactly the same space as the original – a classic, country style design, which was very dark with purple-painted cabinetry and black granite benchtops – and forms part of the home’s main living area. 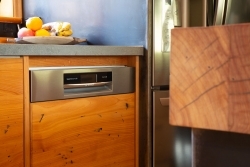 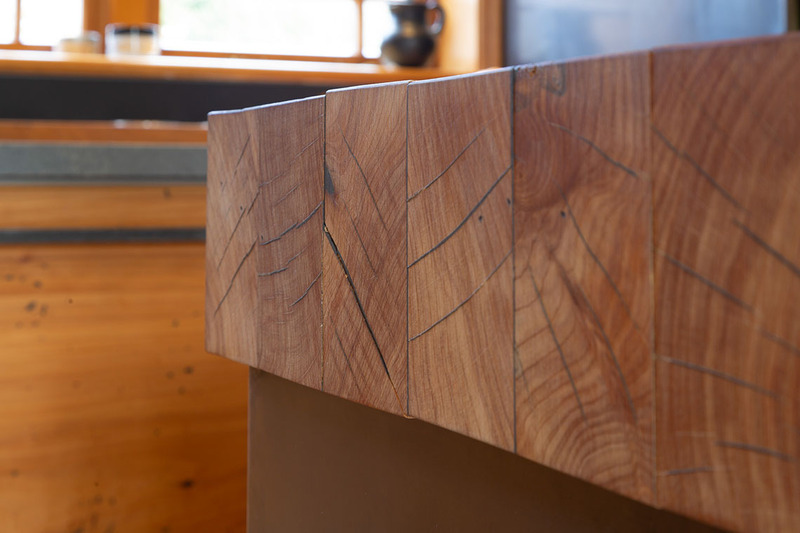 There are many standout elements in Dawn’s new kitchen, but surely one of the most prominent is the substantial 100mm-thick benchtop, made from Macrocarpa sleepers. Anna says it took four big guys to bring it into the house, and it’s certainly not going anywhere now that it’s fixed in place. 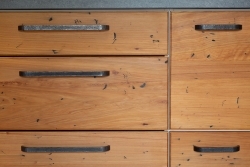 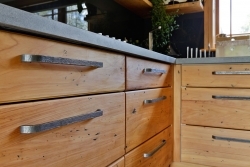 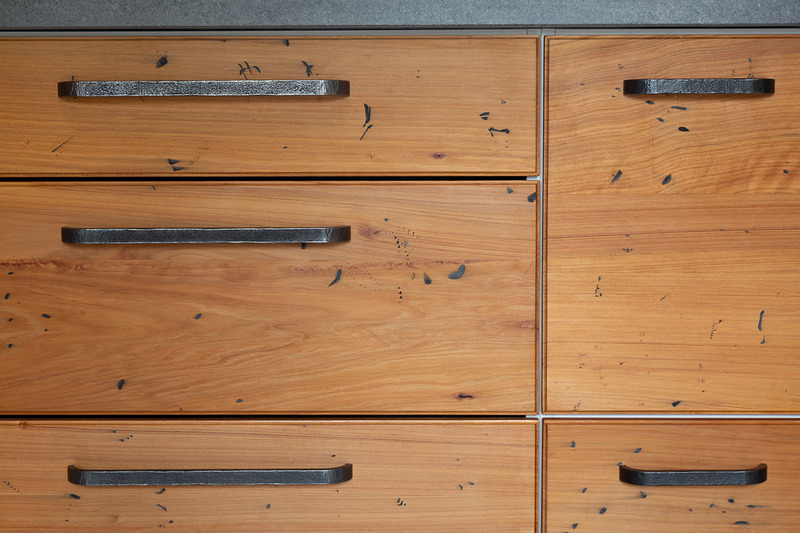 Macrocarpa was also used for the drawer and cabinetry fronts, where a ‘distressing’ process was used to give the required industrial, worn look. 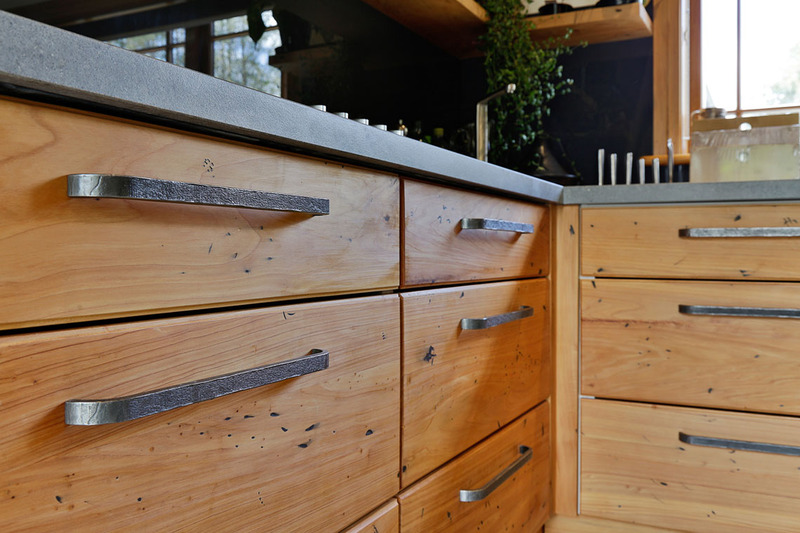 “We used chains to get the indentations, then filled them in with a patina paint, and finished them off with a natural oil finish,” explains Anne, who says that her client wants the timber surfaces to continue to gain character as they age, hence the oiled finish. 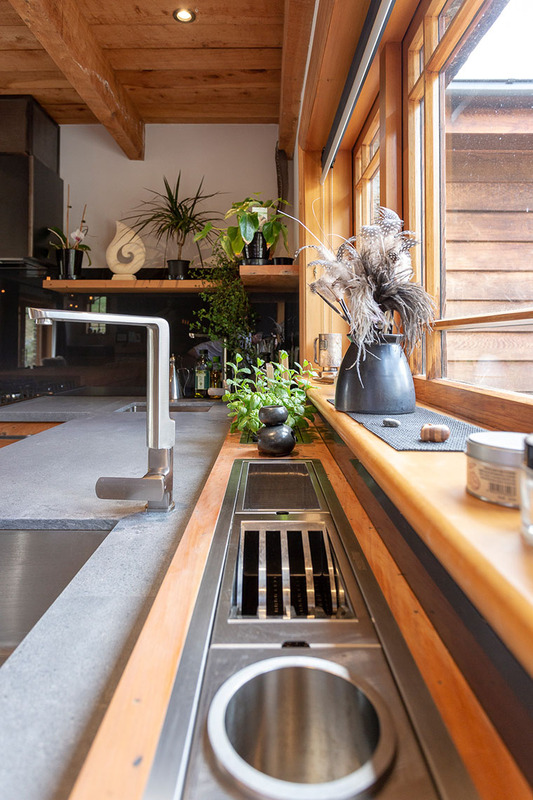 There are two sinks in the kitchen – a large one for washing up and a smaller one in the back corner of the kitchen that is serviced by a boiling-water tap and used for hot drinks. 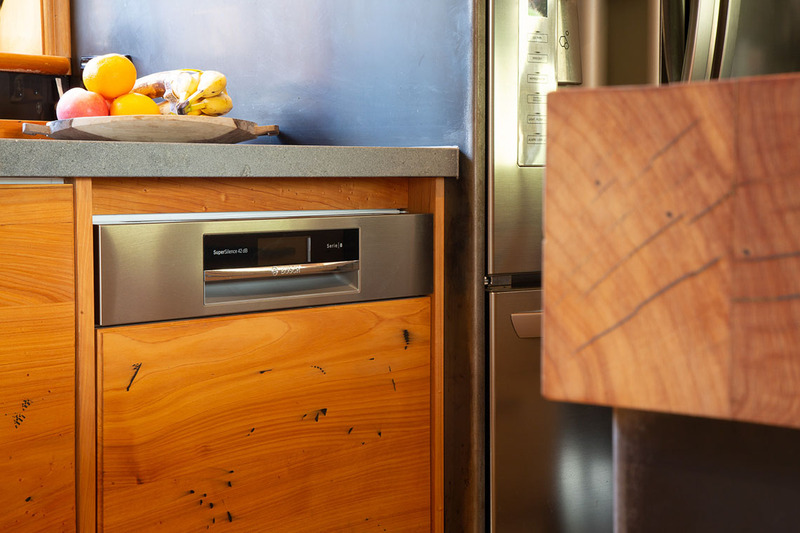 In addition, along the back of the benchtop, directly under the window, Anne specified two skinny ‘sinks’ (1mx100mm) that come with a series of drop-in accessories – a knife block, chopping board holder, plate and cutlery drainer, etc. “These are really handy, because you can just spin the tap around and rinse everything off,” she says. At each end of the L-shaped benchtop are two cabinetry towers – one holding the double ovens, the other the French-door fridge. Both are clad in blackened steel, with mesh fronted cabinet doors above. 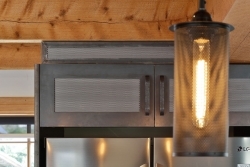 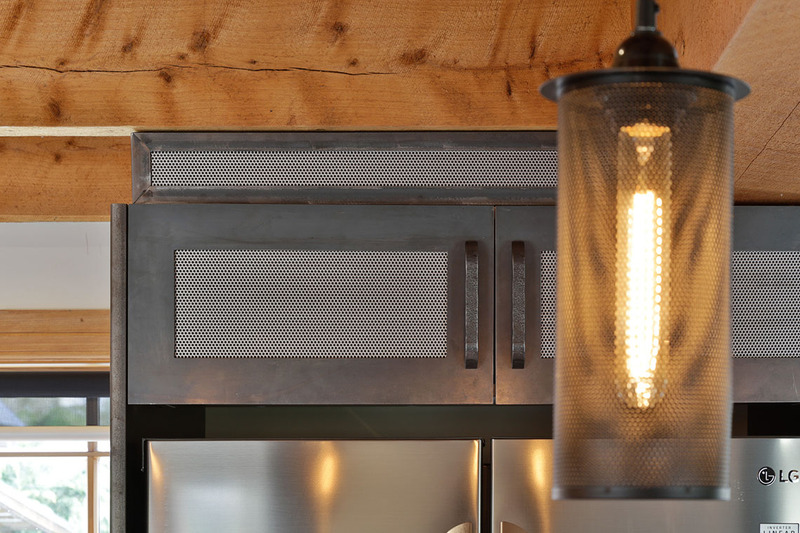 The same metal and mesh design was used to house the extractor above the gas cooktop, and matches the finish of the three light pendants that hang over the island. 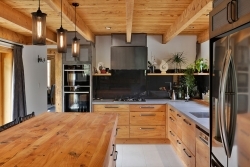 This kitchen was proudly designed, manufactured and installed locally by Mastercraft Kitchens Southland.